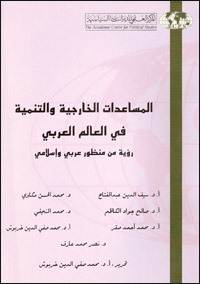 This book deals with the relationship between foreign aid and development in the Arab world through the study of the relationship between Islam and development, as taught and aspects of underdevelopment and development problems in the Arab world from an Islamic perspective, and a case study of the contribution of the Organization of Islamic non-governmental organizations in the development in the Arab countries, and also addresses the role of foreign aid in the context of the philosophy and policies of structural adjustment programs, as well as the limits of the relationship between sovereign country, foreign aid, in addition to the cultural dimensions of foreign aid to the Arab world, and finally the political determinants of the effectiveness of foreign aid for development in the Arab world. The authors address these themes from the perspective of national Arobi and civilized contemporary Islamic perspective. This book is in addition to the Arab library on the subject, offering a different vision of visions about the prevailing aid and reform policies and the reasons for the backwardness and progress factors, without abandon scientific objectivity necessary in such studies.